Gemini featuring a non-Korean that isn't Neeb in one of his guides? Yup. DnS has been rather quietly sneaking his way up into the upper echelon of foreign Protoss' for the last few years and recently he's been really killing it and had some good games at the GSL qualifiers earlier this week. I figured it was time to finally feature one of the builds he used just yesterday in the PeopleImages StarCraft League vs Bunny (who also has been doing very well recently with a 3-1 vs herO and a 3-0 vs Rogue). 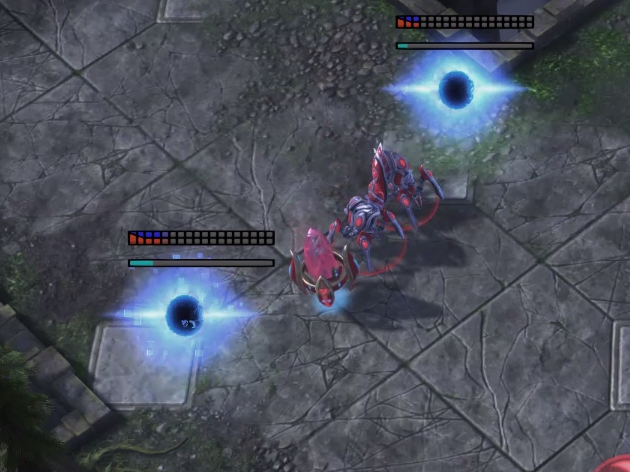 A small variation of the standard blink/robo play popularized by Zest, this build is slightly safer with a later 3rd and also gives you the opportunity to be more aggressive with your first batch of stalkers which makes it a great way to take a little bit more control over your PvTs. If Zest's 4:00 3rd base was feeling a little too fragile for you to properly replicate in your ladder games then perhaps this slightly safer build will suit your fancy. After all, TY said himself you'll win a GSL with it. In this build DnS goes for twilight before robo which is the only slightly risky thing about this build. However, if you see them doing some sort of proxy or other one base play you will know before you put this down so you can exchange it for a robo to be safe vs those types of openings. Besides that, going for twilight first is generally very safe. Cyclone pushes can be held with the larger stalker count early and shield batteries, and hellion run byes are easily swatted away by proper building placement at the front of the natural with your 2nd pylon and extra two gateways. If you are unsure what might be coming across the map, then leave a probe out in the middle on a watch tower or on the path they'll most likely take to see if you need to make shield batteries or not. After the extra gates you can make another pylon and also your robo to start making observers for extra vision. You also get your 3rd gas with the robo. You don't really need the 4th gas this early and it helps the build flow a bit better if you don't make it, however if you don't think you'll be able to remember to get it later on then it'll be fine to get at this time. Then once warp gate is done you'll warp in two rounds of stalkers for a total of nine with blink being done around 4:35 after three chronoboosts on it. With these stalkers you can easily defend any mine drop or liberator harass from the terran and then immediately counter attack to put on some light pressure. A cute alteration you can do with this build is chrono out a warp prism instead of an observer and put on some heavier pressure with more stalkers if you want to really punish a greedy terran or if the terran was wasteful with their early units. It is important to remember: If you don't think you can multitask with this pressure while macroing behind it, then DON'T try to do it. This is for people who feel like they are capable of multitasking and microing blink stalkers while macroing back home, or for those who wish to push themselves in their multitasking capabilities. If you just want to sit home with those stalkers and keep defending then that is perfectly fine. Behind the light pressure you'll be taking your 3rd base and your two forges to scale into the mid and late game. At least two sentries should be made as well for guardian shield in any fights. Then once the forges are done you should start your upgrades and put a majority of your chronoboost into them. Along with the upgrades should be charge and the start of your immortal production which should remain as consistent as possible. At 6:00 you can start the first gateway flood with three gates and then once those are done DnS makes a whole extra five. I believe this is mostly because he scouted that Bunny was continuing with a prolonged two base all in and if this were not the case then he would have only gotten an extra 2-4 with a faster Templar Archives. Even with the prolonged all in, DnS goes for a 8:00 4th base with the templar archives a bit after that so sometime around then is a good time for those. Even with the nerf to chronoboost the mass gateway style still remains the strongest in PvT. Stalkers are still extremely effective early on to defend and pressure Terran and the fast upgrades still allow for chargelots and immortals to scale well into the mid game. Of course stalkers will still scale well later too due to the +2 but it's not like they're the only thing that is being built. They're mostly there just to keep everything safe earlier on and then snipe key units later in the game. So that's why in this build you don't really make many more stalkers after the original nine for the blink pressure. After that you're going to want to put all your gas into the upgrades, charge, the two sentries, and immortal production while most of the rest of your resources goes into a large mass of chargelots. With how many gateways you get in these styles along with the fast upgrades for quick scaling, the chargelots take forever to get through and allow the immortals and stalkers in the back to deal good damage without being touched that much. So it's important to remember that as long as you're trading your chargelots for good chunks of their army while keeping your more expensive units alive, then you're trading well. You're going to have a large gateway count behind you to constantly replenish that chargelot count so you can keep going back in to the fight after retreating if you aren't winning it outright the first time. Due to how many gateways you'll have producing units, going into High Templar and storm as your splash damage only makes sense. Colossus transitions are not seen right now because it simply does not fit well into the army comp. If you wanted to start out with colossi faster on 2-3 bases then that's totally fine and is also a very safe and defensive style you can go for. However, transitioning into them at this point is not ideal as it was with other previous compositions like phoenix/adept. The amount of gateways you'll have will already be exhausting your resource bank quite efficiently and by the time you'd be transitioning into colossus the terran will have a mostly marauder heavy composition anyway. Now that colossi are only good vs marines then it makes going colossi late kind of a waste. Terrans were making mostly marines vs phoenix/adept styles so it made more sense to transition into colossi then, but now it's a different story. Templar work the best with this army composition and the general flow of the match up and in general is the better and more versatile AoE choice. To go along with that, one of the more effective micro techniques during battles that pro players have been utilizing is dropping templar onto the army to get big value out of their storms. This is definitely very micro intensive and I wouldn't suggest everyone try this since it can easily backfire, but for anyone capable or trying to push themselves then it's a great way to easily turn the tide of a battle by getting huge storms right in the middle of their army. This also protects the templars from being EMPd before the fight begins, but adds the additional downside of being sniped by liberators or vikings. Since colossi are not present in this style and liberator anti-air damage is quite low, this isn't really a large issue to worry about. Blink pressure into 2gate macro? Wait is it 2014? You can also what stats does and make the 2 forges before the third, it can make the game a lot easier in term of decision making and you can allow your third to be canceled if they go for some kind of yolo mass marine/marauder pushes. Thanks Gemini! This one looks like fun, I can't wait to try it out on ladder. how do you defend vs this? siege tanks? Tanks are good sure, or just very defensive bio play. I've had people just go for 3rax after expand for strong 2 base timings and my stalker pressure can't do much other than pick away at them while they're walking across the map. I think 2-base pushes or fast 3CC are the standard response, but even top Koreans are struggling to deal with this build (or small variations thereof). Either way it seems like big timings are the way to go, I haven't seen much lategame at all. Even if you push with 3 rax the sheild battery does support gateway units quite well. and the zealot charge + 8 damage that attacks twice which is = 16 damange with NO upgrade is quite cumbersome to deal with. just venting, but i literally have no idea how to deal with protoss with the current state they are in. the only way to beat them is by doing constant drops being annoying like a mosquitoe, while trying your best to macro back home. Even though I hate you for helping Protoss players, I gotta say this is amazing work once again. Keep it up GG e mini 19! Newish to TL, just saw these guides! Excited to give it the test. Thanks! Watch the games from Inno vs Creator. Those types of 2 base pushes are extremely strong. Isn't that because Creator opened Stargate? His double Oracles didn't get much done either. Hence, this build is not applicable to inno vs creator game. Innovation is on a different level compared to creator and creator is more of a macro player, if you see the vods thats what artosis says. Those types of pushes aren't only good vs people who open oracle. They're just strong pushes in general that are very defensive early on to allow as little room for protoss to pick away at them as possible. This build is the BOMB, Terrans in lower platinum get stomped by 9 Stalkers that early and the lessons it teaches me about macroing at home while pressuring out on the map are invaluable. Thanks again!